Home / News / Worldwide Cost of Living Index Report / Is Singapore really the most expensive place in the world to live? We don’t agree. Is Singapore really the most expensive place in the world to live? We don’t agree. 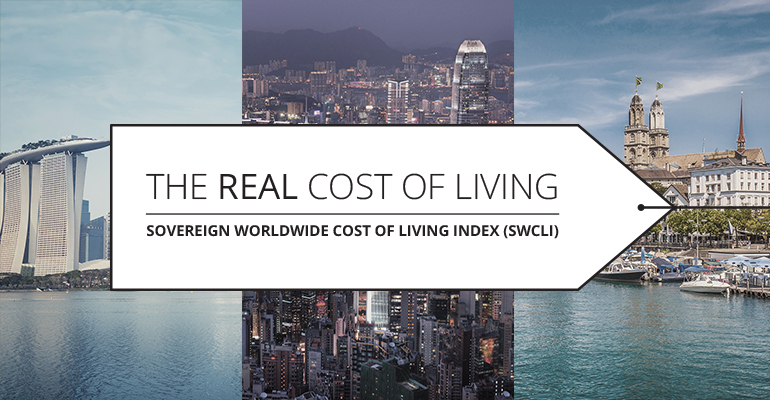 Sovereign’s tax-adjusted Worldwide Cost of Living Index is intended to provide businesses with a relevant and authoritative benchmark on which to formulate compensation packages for overseas staff. It factors in not only the comparative prices of goods and services in cities around the world but how much an individual living and earning in a particular city would need to earn to afford these goods and services after paying local taxes. “We were quite surprised by the results. Hong Kong and Singapore, which are the world’s most expensive cities (according to the Economist Information Unit), drop out of the top 10 altogether when you factor in the tax.” Howard Bilton Chairman of Sovereign. Sovereign is here to help with your private client, corporate services and retirement planning needs, where ever you are in the world. To read coverage on the report click on one of the links below. Please enter your details to download.